As a valuer you come to expect the unexpected. You never know what will appear during one of our valuation appointments, when the general public are invited to bring along antiques and collectables of all sorts. Recently a client brought along an inherited collection of postage stamps. Unusually the stamps weren't in albums, but on loose sheets and evidently included material drawn from a significant historic collection. 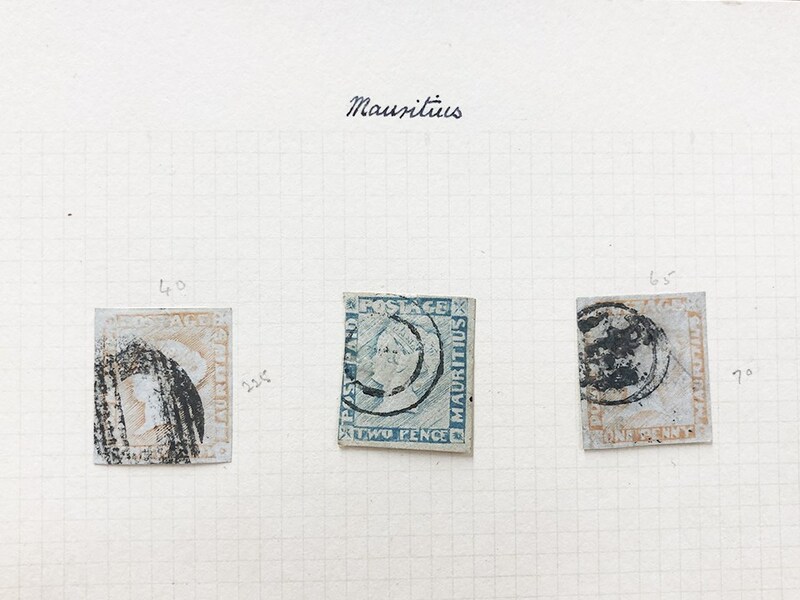 Amongst the collection there were mixes of early British issues, and interesting colonial stamps; including a single sheet of stamps from Mauritius. A stamp collection with a tropical flavour is worth a closer look! The islanders of Mauritius were amongst the first of the crown colonies to adopt the postage stamp. The first of their issues were engraved by Joseph Osmond Barnard, born in England in 1816, who stowed away on a ship to Mauritius in 1838. His designs were based on the then current Great Britain stamps, bearing the profile head of Queen Victoria and issued in two denominations. The colours - a one penny red-brown and two pence blue - also conformed to the current British issues. The Mauritius' locally produced stamps have a distinct primitive character and the very first productions of September 1847 featured a vertical panel with the words POST OFFICE. Five hundred of each value were printed from a single plate bearing both values, many of which were used on invitations sent out by the wife of the Governor of Mauritius for a ball she was holding at the end of the month. These issues, known by collectors as the 'Mauritius Post Office stamps' are counted amongst the rarest of stamps and would command a seven figure sum at auction. Our sheet of Mauritius stamps doesn't feature such issues but does include three stamps from the rather similar designs published from May 1848, with a POST PAID panel . The three stamps, two penny reds and a two pence blue must be classified as worn or late impressions, the printing plate having been used and reused resulted in the designs becoming less distinct. However, the design remains that of Barnard and these stamps offer the discerning philatelist a rare opportunity to acquire stamps closely related to the legendary editions of 1847. The ‘Mauritius Post Paid’ stamps are featured in our Antique & Collectors auction on 16th April with an auction estimate of £200 - £300, alongside other GB and Colonial stamps from the same collection.